Aseltine said his concerns were not about whether or not Moran was in favor or against the school project. "He is entitled to his opinion. The problem was that while he was running the town site he was also posting personal attacks on the Select Board members and the former superintendent of schools." "We just think that Jim is no longer in a position to run the town site objectively." As has been mentioned in previous posts on LongmeadowBuzz, Mr. Aseltine could not provide any specific examples of how the LongmeadowBuzz blog postings affected the posting of information on the School Building Committee or Town of Longmeadow websites... because there were none! I guess that Mr. Aseltine believes that I am entitled to my opinion as long as I don't go public with it. The so-called "personal attacks" referred to by Mr. Aseltine were directed at the School Building Committee co-chairs (not Select Board members) and the Superintendent of Schools because it appeared that they were directly involved with what happened to the "disappearing/ reappearing" public correspondence in November between the SBC and the MSBA. Mr. Aseltine and the SB are now engaged in the development of a new "government based" website where there will be clear guidelines for the new webmaster so that problems do not arise in the future. We can all guess how revealing and insightful that information will be for town residents. I suggest that Mr. Aseltine take a course in how the Internet has transformed politics and almost every other aspect of life. The online world can respond much more rapidly.... and it can be quite effective (or damaging) in how it is used. I don't take this responsibility very lightly. 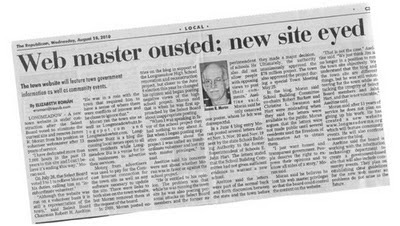 I recommend that town residents interested in staying abreast to what is happening in Longmeadow visit the LongmeadowBuzz blog occasionally. On Monday, August 23 starting at 6 PM, the Longmeadow Select Board will conduct an "offsite" goal setting meeting in the parlor of the First Church of Christ at 763 Longmeadow Street in Longmeadow. As I understand it, LCTV has been asked not to televise this session. It is interesting that the majority of the Select Board (Aseltine, Barkett and Swanson) want this meeting to be "off camera" so that process of goal setting and priority setting can be "more focused and relaxed". Gold and Santaniello want the meeting to be taped for later broadcast. section 20e: (e) After notifying the chair of the public body, any person may make a video or audio recording of an open session of a meeting of a public body, or may transmit the meeting through any medium, subject to reasonable requirements of the chair as to the number, placement and operation of equipment used so as not to interfere with the conduct of the meeting. At the beginning of the meeting the chair shall inform other attendees of any such recordings. The Longmeadow Volunteers led by Bill Morey are a group of town residents that volunteer their time and effort to help make Longmeadow a more beautiful place to live. This group was formed several years ago and they coordinate their effort with the Longmeadow DPW. The volunteers bring their own equipment... and if necessary the DPW follows up on Monday morning to pick up the brush and other debris from their work. Projects have included cleanup of many different areas of town including school building grounds, town building grounds Blinn tennis courts and the LHS track facility. A couple of weeks ago they cleaned up the American Legion building which is the old Town Hall. Last weekend in preparation for the beginning of the new school year, they started "sprucing up" school grounds starting with Center School and this past weekend the team was at the Glenbrook Middle School and Williams Middle School. Below is a short video of the cleanup work that was done at Glenbrook Middle School. Next weekend, August 21 their work shifts to the Longmeadow Adult Center on Maple Road from 9 am - 12 noon. If you have some time and want to help, contact Bill Morey via email at billmorey@comcast.net . The location for future work will be posted on the Town Calendar.